The first time that I brought Big Sister E to my mom's house and she pulled out wooden toys that were from my childhood, it took me a little while to warm up to the idea of something so old still being safe for my child. However, the more that I thought about it, the more I realized that the toys that truly can last through multiple generations are the ones that I do want for my kids. Even though the plastic ones can be fun, it's the natural, well-crafted, simple toys that are going to spur their imagination, be completely safe and last for generations to come. 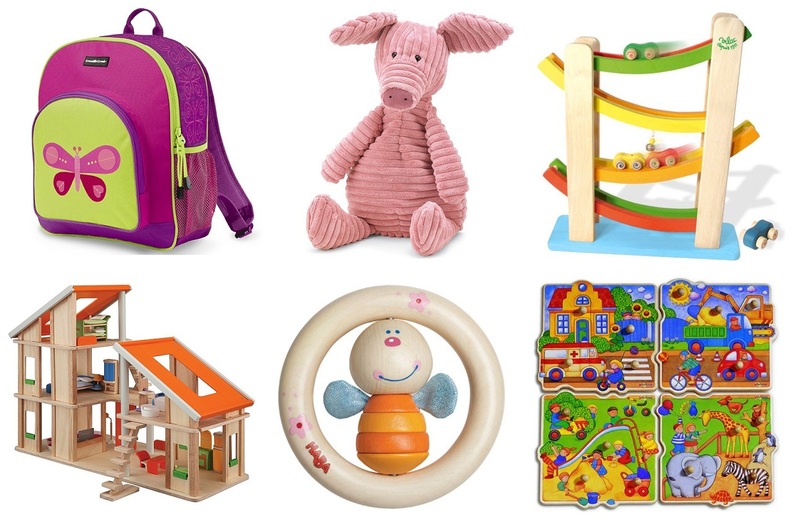 Inspired by similar thoughts and European roots, parents don't have to look any further than Goblin Kids to find everything from unique baby gifts to educational infant toys to great eco-friendly and organic items that are high quality, safe and (of course) fun. 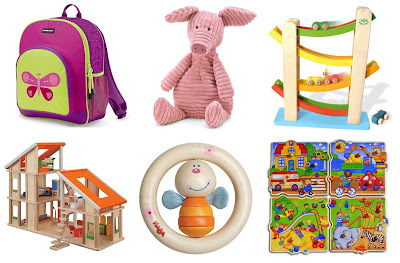 Browsing through Goblin Kids' collections of European wooden toys, items for pretend play or great gear for kids is quick and easy due to their user-friendly site. Search by category, brand or age and you'll find page after page of results that are beautiful, natural and set to inspire creativity. And watching that creativity come into play with my daughters and their Tea Set from Plan Toys has shown me just how much fun kids can truly have with simple, gorgeous toys. 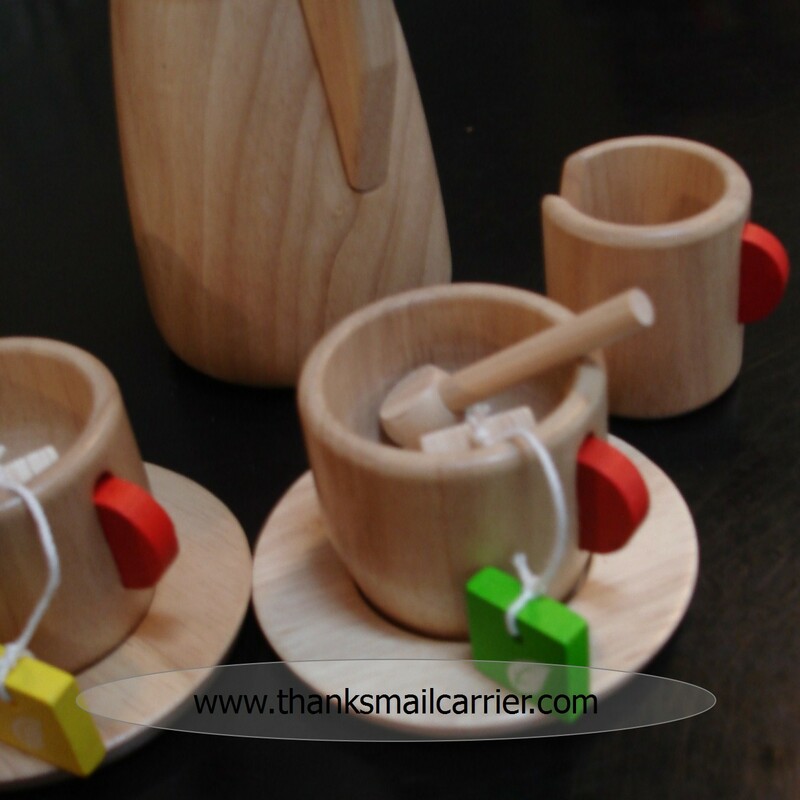 Not just a teapot and cups like other toy sets, the Tea Set from Plan Toys is a wooden collection consisting of a teapot, sugar bowl, milk pitcher, two tea cups, two saucers, two spoons and, get this, two tea bags and two pieces of sugar. How fun is that? Both Big Sister E and Little Sister B immediately liked the fact that they were able to add a tea bag and sugar to their cup after pouring in their pretend water and proceeding with their tea party. As Plan Toys are made from earth-friendly and non-chemically treated rubber wood, non-toxic glues, safe water-based dyes, soy ink and recycled materials, I wasn't the least bit concerned about letting my daughters have a good time sipping out of these cups. This set is recommended for ages 3+ due to the small pieces, but Little Sister B didn't have any problem understanding that the items like the sugar and tea bag weren't actually meant to go in her mouth. 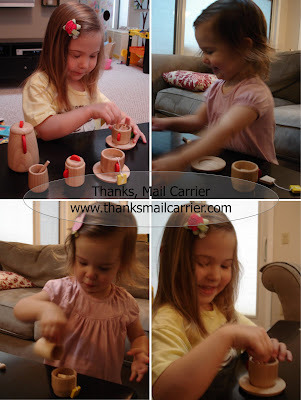 In fact, every time she plays with the Tea Set from Plan Toys, she takes her role as tea brewer and server very seriously. And every time is a fun new adventure as you never know how our tea parties are going to turn out! With a huge array of items that encourage children to role play, think critically or just explore the imaginative possibilities, Goblin Kids has toys and accessories to build social skills or individuality while enhancing their creativity. There's something for every age, personality and ability that is sure to be a big hit! One lucky person will win a $25 gift certificate to Goblin Kids! To enter to win: Visit Goblin Kids and tell me which of their great items is your favorite. 3 Extra Entries if you blog about this giveaway linking back to Thanks, Mail Carrier and Goblin Kids. Giveaway will end on November 5th at 11:59pm CST. Do me the favor of leaving an email address or making absolutely sure it is visible in your profile, I have to have a way to contact the winner. The winner will be chosen by random.org and announced here as well as emailed and will have 48 hours to contact me or respond to notification or a new winner will be chosen. This giveaway is open to residents of the U.S. and Canada only. A big thank you to Goblin Kids for providing a Tea Set from Plan Toys for review as well as a $25 gift certificate for one lucky giveaway winner. The opinions shared are my own and honest and if you really need to see more, click here to see how I roll. I love the animals from animalz! They are so cute! Its really hard to choose! I'm thinking the 5 level anatomy (or body) puzzle. I also love the Banjo from Plan Toys. So cute! I love the Farm Tails Book from Jellycat! So cute!! I like the Early Melodies Tambourine from Educo. have your very cute button! I follow Goblin Kids on twitter. I follow Goblin Kids on facebook. My dc would love any of the Constructor sets. Hours of fun! I liked Goblin Kids on FB. I posted the message on their wall on FB. I've entered the Need Costumes giveaway. I love the Balancing Cactus from Plan Toys! I would love My Rooftop Garden Home from Educo for my daughter and for my son I like the Seven Goblins Bowling Game from Haba. I entered the TJ Maxx/Marshalls giveaway.